When it to eating in Jackson, there’s a seemingly never ending supply of home style fare. With everything from the mega buffets to the small mom & pop restaurant, you’re never far from a plate of meat and three. 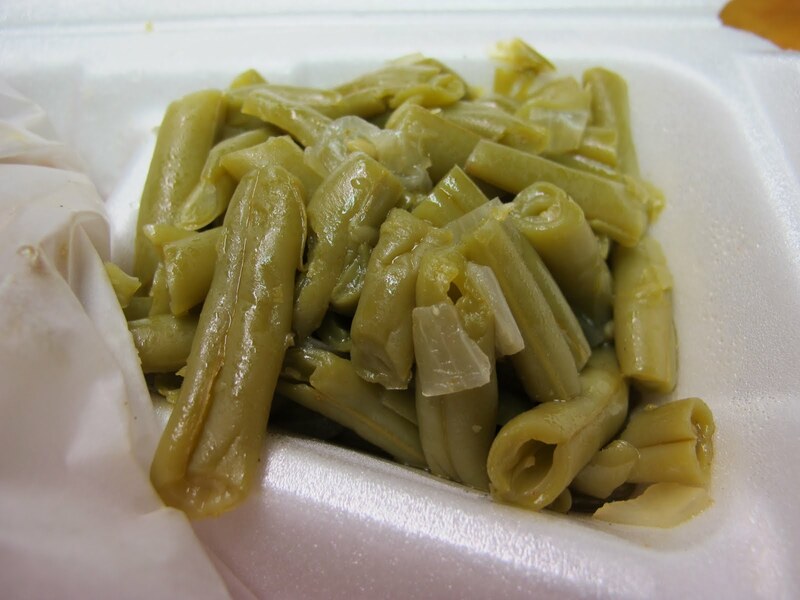 Even in downtown Jackson, you're spoiled for choice about where to get your plate of veggies. That leads me to Sugar’s Place. 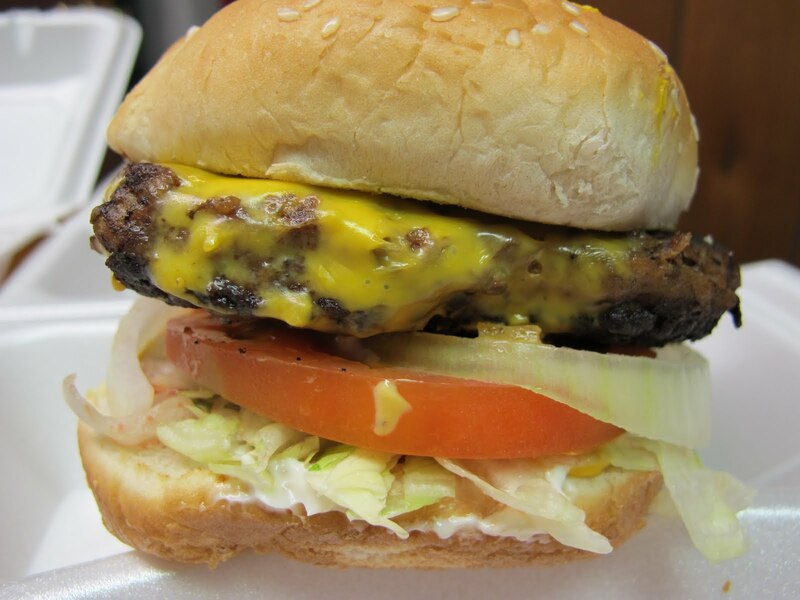 Located across the Mississippi College School of Law, Sugar’s Place thankfully fits in the smaller end of the home style spectrum. Seeing as I rarely eat breakfast outside the home, I only took a look at what Sugar’s Place had to offer for lunch. The Philly Cheesesteak seemed like an excellent place to start. I love seeing the Jackson take on a Philly Cheesesteak. 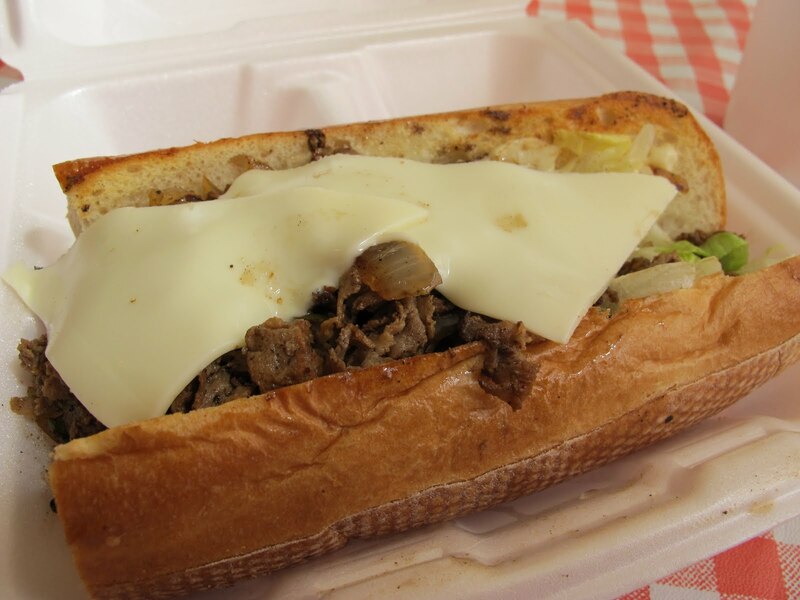 Of course slapping two slices of unmelted cheese makes it a cheesteak, that’s not at all an afterthought. Actually, I was a little unnerved by the addition of lettuce on the cheesesteak; seems like they lump po-boys and cheesesteaks into the same category. Once I looked past the cheese on this sandwich, I was pretty happy with what I found. 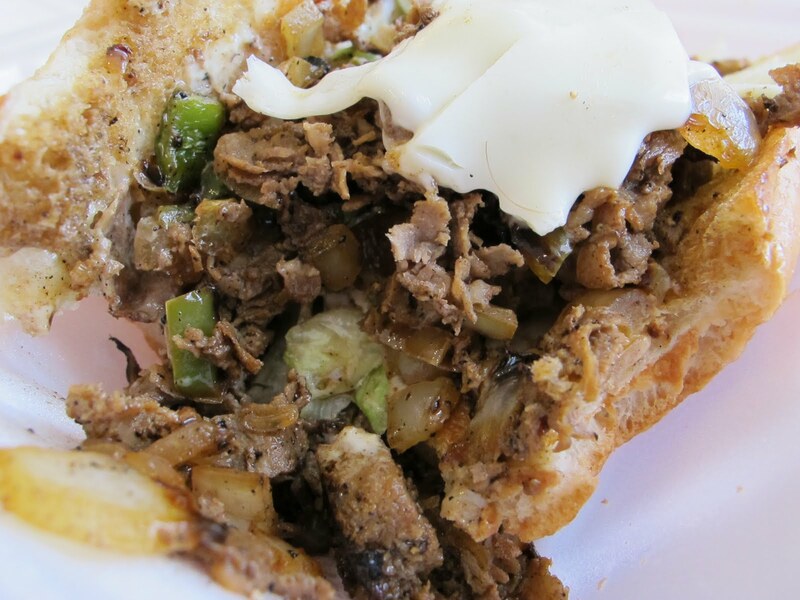 With dark caramelized onions and plenty of rich beef, this made for an excellent sandwich, even if it was more akin to a po-boy than a Philly Cheesesteak. There’s something wholly satisfying about a good club sandwich. Maybe it’s the simplicity of it, or the combination of all the things that are bad for you, who knows? Needless to say, I gave the Downtown Club a try. 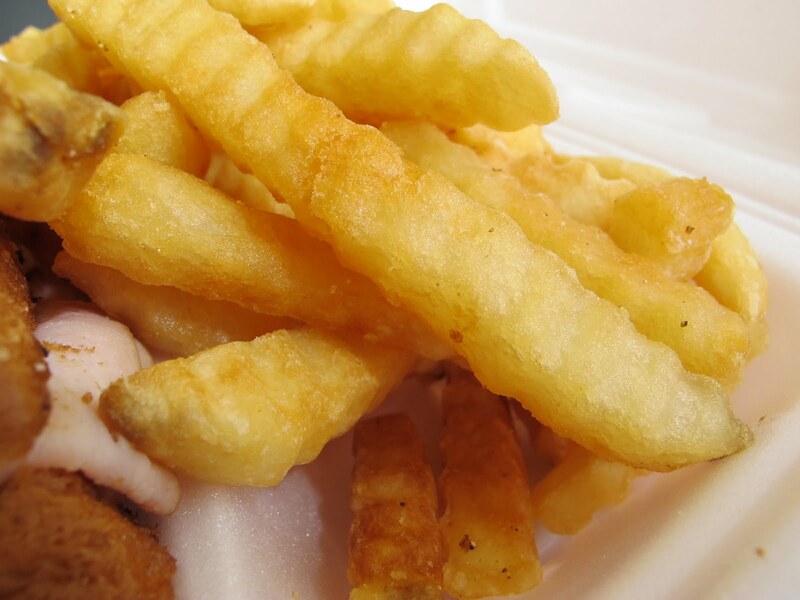 Served with a side of crinkle cut fries, it’s basic and big. 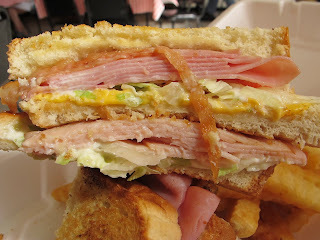 This sandwich is a monsterous double decker with three big pieces of Texas Toast, ham, turkey, a solid layer of cheese, and the full compliment of mayo, lettuce, and tomato. 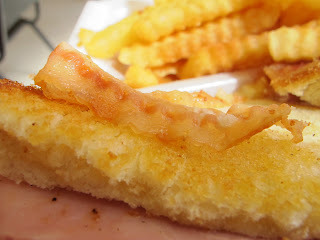 The only real downside to this club is the bacon. I know I’m often described as a bacon snob, but really? That’s a sorry example of bacon if I’ve ever seen one. What about that side of fries? You’re not missing anything here; they’re not well fried and not well seasoned. As I’ve said before, any good lunch spot needs to be on the ball for take-out as well as dine in. 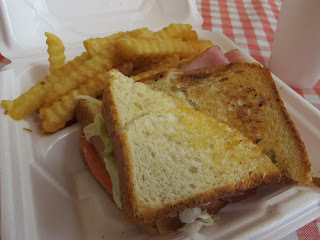 So the next time I went to Sugar’s Place, I left with my lunch steaming in Styrofoam. Despite being disappointed more often that not with the burgers in Jackson, the Cheeseburger from Sugar’s Place was in the first Styrofoam box I opened. 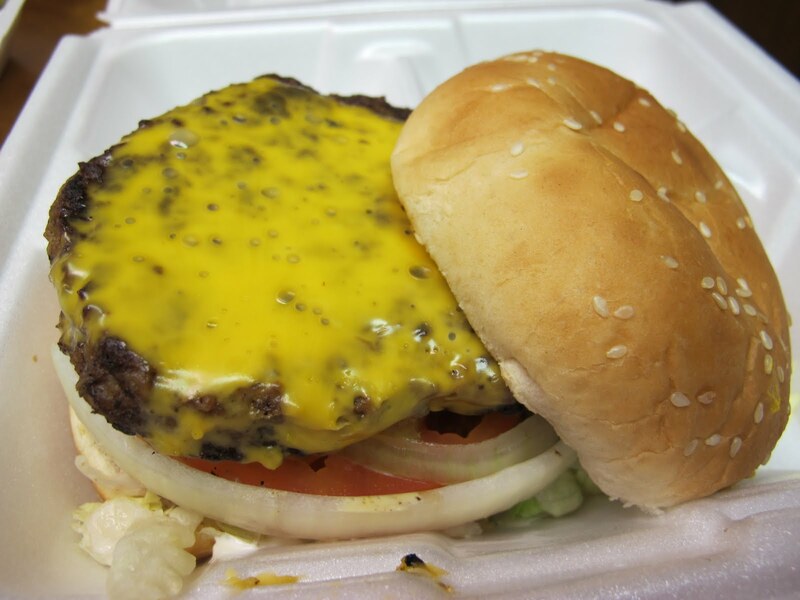 With completely melted cheese, a ½ lb patty, and all the trimmings, it certainly makes for a pretty picture. Yes, it looks very nice indeed, but looks can be quite deceptive. Looking like it was only cooked on one side, this is just a quick, overcooked burger. 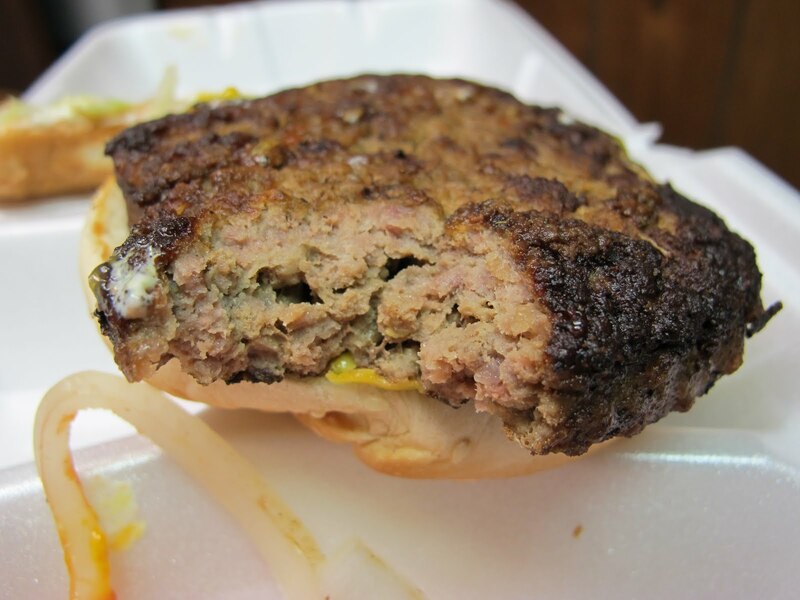 Next time, I’ll pass on this desiccated piece of beef. I’d be remiss if I didn’t try at least one meat and two veggie plate from Sugar’s Place. 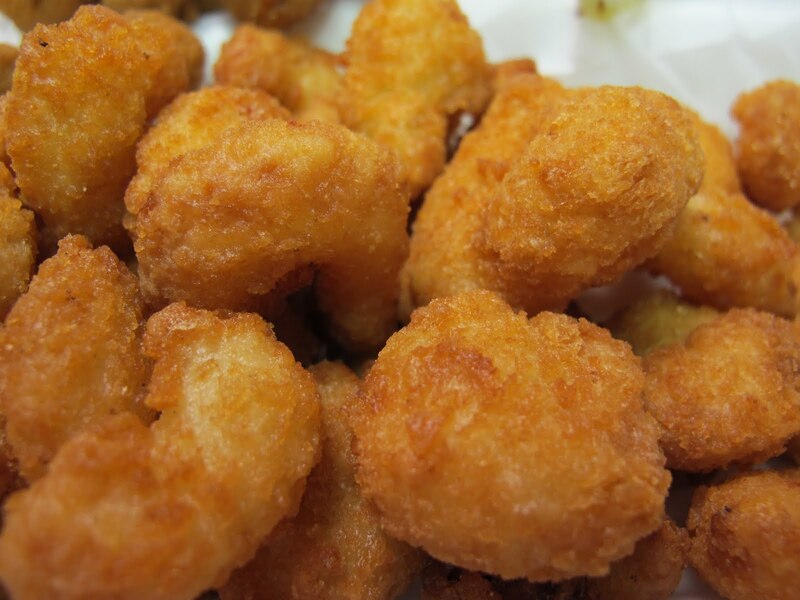 Popcorn shrimp isn’t your average meat choice but who can turn down a good fried shrimp? With seemingly more breading than meat, these are your typical popcorn shrimp. Crispy, a little salty, and numerous, it’s not going to win awards, but these popcorn shrimp are a decent meat choice. Moving on to the vegetables of this meat and two sides plate, I kept things uniformly brown with a choice of fried okra. 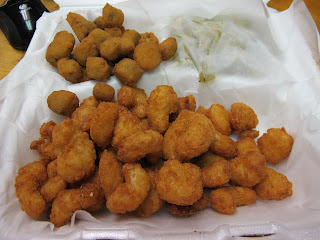 Looking a lot like the popcorn shrimp, this okra was also more breading than actual okra. It really seemed like the okra and shrimp had both been pre-fried, frozen, and refried. 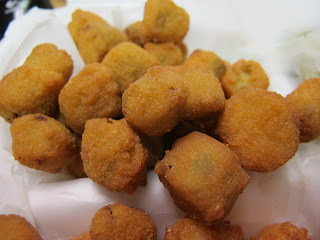 At the very least, this okra was crispy. Breaking free of the brown with a side of brown combination, a side of green beans rounded out the meal. Plain is the name of the game with these beans. With no pepper or pork to get in your way, you can fully embrace the beans and onions, if that’s what you like to do. I really wish there was a more eloquent way to express my sentiments from Sugar’s Place, but it really left me shrugging my shoulders and muttering “meh.” There’s nothing horribly wrong with Sugar’s Place, but there’s nothing fantastic about it either. It’s really just a decent lunch place that’s fast and reasonably priced. Sometimes all you’re looking for is “some food”, and that may be just the niche that Sugar’s Place has filled.